DJM Capital plans to revamp the dilapidated Lido Marina Village with a new marina, upscale restaurants and retail stores. The first phase of the project is on schedule to be completed by the end of July. Newport Beach project would revitalize high-traffic area of the harbor. NEWPORT BEACH — A dilapidated corner of Newport Beach is finally undergoing a facelift as the Lido Marina Village revitalization project is underway. The project’s first phase is on pace to be completed by the end of this month. A firm representing DJM Capital said the redevelopment project would feature a reconfigured marina to accommodate small and large boats, dinghies and kayaks. Shops, restaurants and creative office space will also be featured at the new Lido Marina Village. Williams said the project hopes to gain California Coastal Commission’s approval of the second phase shortly and have the rest of the marina completed by late 2017 or early 2018. The project’s second phase, if approved in its current form, would provide additional boater amenities. “In the second phase, we will be accommodating small boats 35-45 feet in length, kayaks, dinghies, transient sideties, and larger vessels 35 feet to 82 feet in length. It will also include a low freeboard dock for easy launching of kayaks. The transient dock sideties will limit time to about an hour,” said Williams. “The small boats and larger vessels are month-to-month (or longer depending on the boats) leases. “We will be extending the boardwalk 6 feet and that will be built with the second phase marina,” she continued. The anticipated completion of Lido Marina Village’s first phase comes more than three years after DJM purchased Lido Marina Village from Vornado Realty Trust. 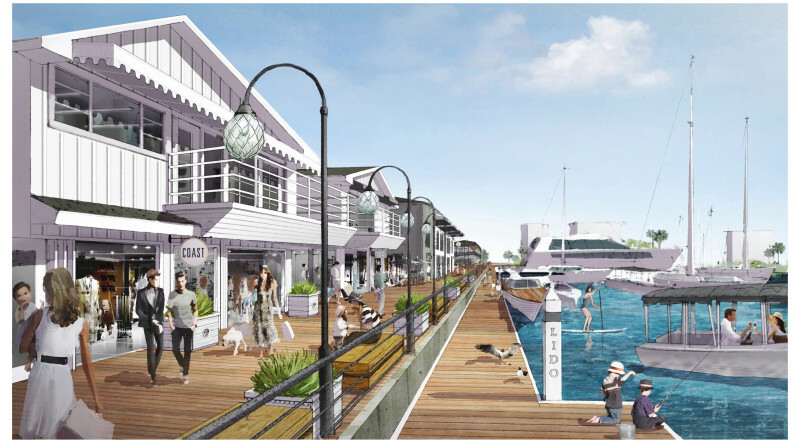 In 2014 DJM presented conceptual plans of a revitalized Lido Marina Village to Newport Beach City Council, which ultimately called for about four dozen boat slips and docks as well as 116,000 square feet of space for boutique retail, creative office, and restaurant space. Linda Berman, DJM’s chief marketing officer and executive project director of Lido Marina Village, said the revitalization project would re-energize a central Orange County coast commercial district with a balance of waterfront amenities, dining options and high-end retail. Some tenants ready to fill Lido Marina Village once it opens include Nobu Restaurant, Elyse Walker and Planet Blue, among others. Newport Beach has hoped to revitalize the 17-acre Lido Marina Village area since 2010. Other plans to upgrade the area include Central Avenue Pier and a public anchorage at the nearby Turning Basin. Both the pier and anchorage would be connected to Lido Marina Village, giving Newport Beach boaters access to several amenities and services, city officials hope. DJM is headquartered in San Jose and recently completed the Pacific City project on Pacific Coast Highway in Huntington Beach.